Time for a new project, since I realized I had mostly one handed swords in my "collection". Always liked the HT longsword, with its flared shoulder and slender profile. I got a bow-tie guard from a trade with Sean F a while ago, and a scent stopper pommel from Sonny at VA last year. Below is what my week end build looks so far. 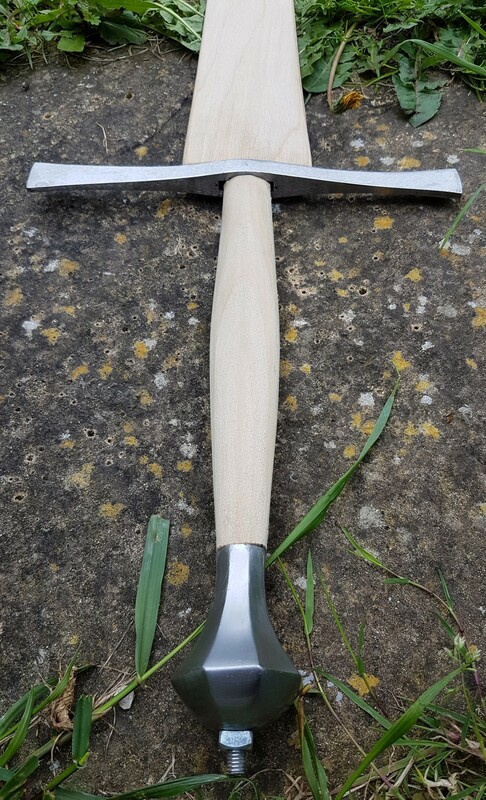 Chopped two inches of the very long tang, and grinded the tang for the pommel to sit closer to the guard. Poplar handle - needs more refinement (too fat in the middle), but feels quite nice already. The guard fits like a glove, and the blade recess is perfect for this blade two. A very easy ride so far, as fiddling to adjust guard/pommel is where you spend most time on a sword assembly. 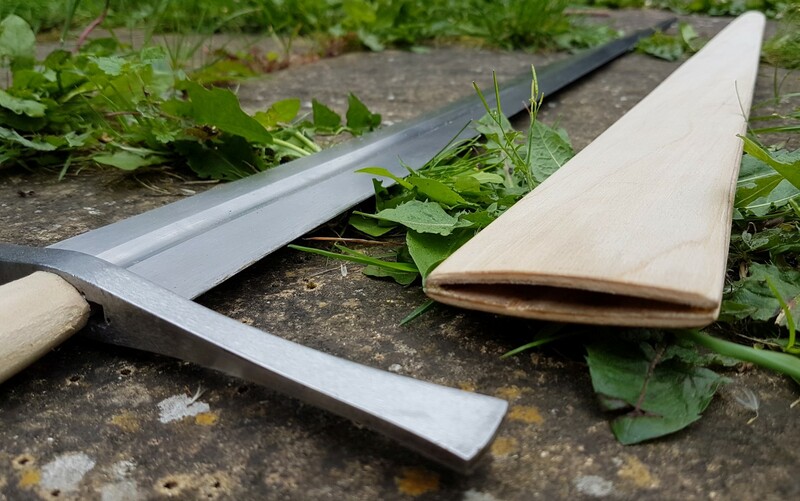 Scabbard was made with slats of 3mm plywood. I soaked and clamped them last week, left the whole thing to dry until today (don't forget to oil and protect the blade with plastic wrap (see set up below). The longer you leave it the better I find. Then apply a thin line of wood glue with the naked blade inside, clamp around and let it dry (pics below of 3 WIP scabbards). This technique produces the best fit and gorgeous looking cores for very little effort (see fit on pic below). The trick is to ensure that the blade can move in an out. Experimentation will get you there. Inserting veneer strips inside works, but my favorite way is to add a long strip of cardboard inside on top of the blade. Also insert the blade 1 cm further down the future scabbard. This will also result in being able to insert the blade fully once glued without having to force it down. These simple tips will likely make the difference between success and failure. I also find that the fit improves with time so don;t get too worried if you struggle to put the blade in the scabbard at first. 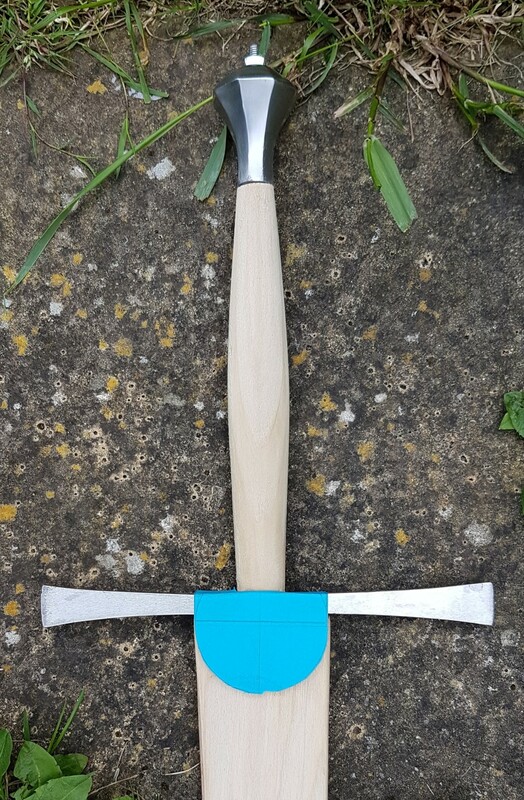 With past attempts, after leaving a sword in such a core for a few month I had to tap it down with a rubber mallet with the tang clamped to a vice to be able to free the blade. I oiled it and put it back, and now the fit is perfect. I have at least 2 other guards that could have been good candidates for this blade (one that could produce a very brescia looking sword that I considered first). Hope you like it and comments welcome. Something about the straight bowtie looks a bit strange to my eye.. it is an odd combination with the pommel, and something about it looks a bit strange visually.. perhaps if it got an S bend, or had the guard turned down toward the blade? Not sure. Rain guard might help..
Julien, I really enjoy your DIY threads. Good craftsmanship, good explanations, good photo documentation. Thank you for sharing your work. First, your tip about positioning the blade 1 cm deeper into the scabbard makes sense. However, the sword I want to try this on is already mounted and peened. Any suggestions, or should I just go ahead and do the clamping normally and not worry about that extra cm? Second, regarding the plastic wrap: are you just talking about regular kitchen cling wrap for storing food? Do you wrap it around the blade a few times, or just one layer to be as thin as possible? Yes I struggled with it at first too, then somehow got accustomed to it. This is good feedback, I'll probably post the other guards too for comparisons before making this permanent. Something may be slightly off with the proportion of the hilt. I just went along and did not stop much for design considerations - while I usually reproduce proportion from museum originals. Worth double checking. Thx Brian - glad it's useful. You have no choice here, so I would just trace the blade on cardboard and slide it inside. If that's not enough, get some veneer offcuts on ebay, and cut thin bands that you will glue on the edge of the inner core, were you will glue to close. This will give you the room you need to slide the blade in and out. and yes - simple kitchen wrap, 2 pass. 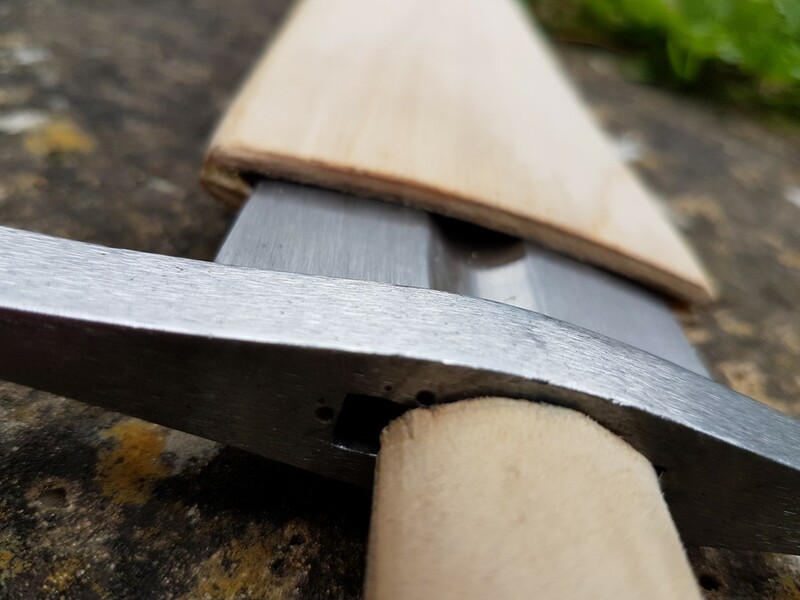 I would not worry about the thickness, when the blade is out after clamping it's very thin indeed. On a mounted sword, I would wrap and oil the hilt too. I think I may change course to use the straight guard on the top. wheel pommel fits better with the bowtie for sure, but want a scent stopper on this. I strikes me that the grip is still way to long and ill formed - I'll fix this. The one in the middle is my favorite - but I made this for my upgraded sword of auray project, and intend to use it for that. I like number I (the straight guard), of the three most recently posted photos with the scent stopper, personally. I concur with your thoughts that the bowtie guard has a better look with the disc pommel. 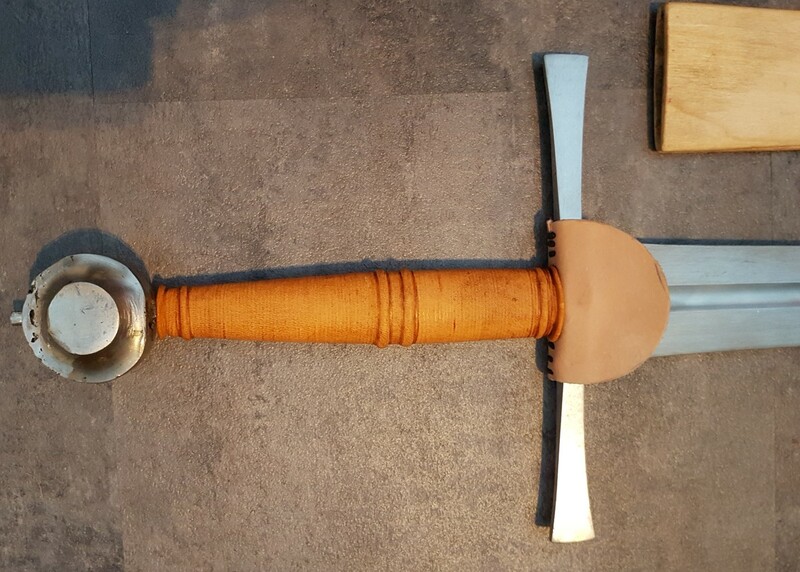 Which pommel is closest in weight to the one that comes with the sword? Both of them look good. Made a rainguard too - the hard part here is finding a design to carve on the flaps....beasts, floral design...that step can take a loooong time (I don't sort my source pictures and I should). I'll probably give this another go. If anyone as a better idea to fill in those holes and crevasses, I'll take it (I've done that with plummer solder in the past - but steel patinate darker and this will show after a while. Looks good, though I did like hilt number 2 best. Might I ask, how did you get that pommel from Sonny? Indeed, it, to my mind looks like a 'proper' sword. The option that you chose is by far my favourite! It looks much like the type of sword you see in German manuscripts, during the 1420-1440 time period - with the Type J pommel and Style 5 guard, with semi-circular rain guard! 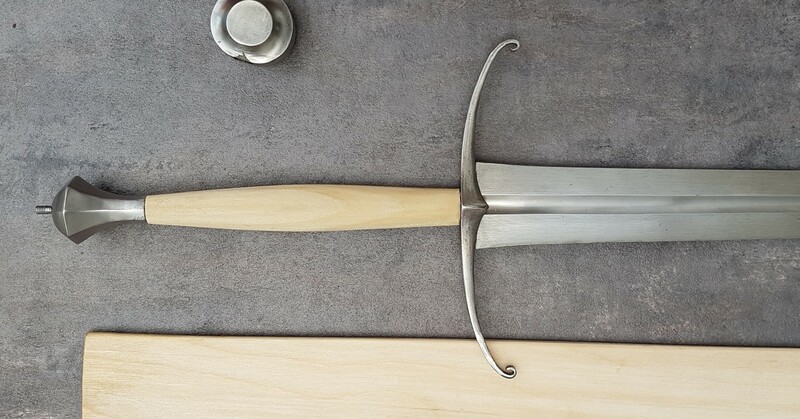 One of my favourite combinations for an earlier thrusting sword, and looks like one of my favourite historical examples of all, the famous Ljubljana sword. The revised grip looks much better too! Can't wait to see the finished product! looks like one of my favorite historical examples of all, the famous Ljubljana sword. I have another long sword blade so other hilt combinations may still happen. I should say that it is made to fit valiant blades, which are on the very light side, and though it looks good, it is too light for much of my blades including this one and I will likely list it on the marketplace soon. I vote for 3 in the end, remind me of my first sword, the MRL Towton which I sold but miss. I don't love, love any of them, but... 3, 2, 1 in that order. Design 3 definitely looks nice, but I'm the oddball out here and actually lean toward design 2. To my eye it appears simultaneously sleek and aggressive. Something about that guard with the scent-stopper pommel just really pairs well for me. Good luck in choosing!